Yesterday began full of promise. We had a laundry list of things to do and, for the first time, it didn't include laundry! Instead we took the guys down to the YMCA to take part in the annual Derby. Apparently in our town the word derby does not follow its traditional definition and instead is an event where people hit baseballs, climb rocks, and listen to a guy singing Jim Croce songs. Our favorite (and Jen's father's least favorite) ice cream shop, Longford's, was present handing out samples of their peach ice cream. 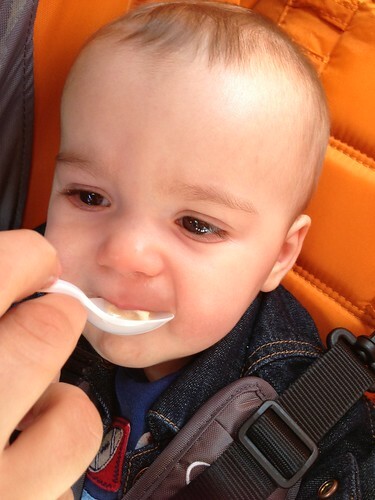 The guys were fortunate enough to have an early first taste of ice cream. 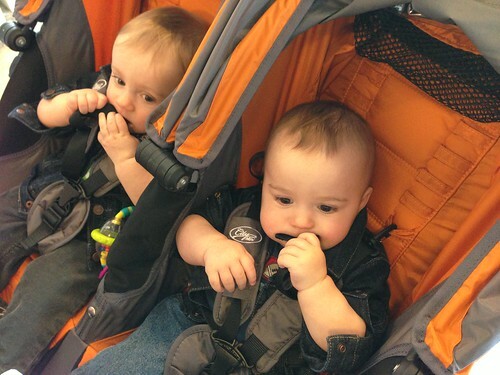 Just not quite as much as they liked chewing on the straps on their stroller. After that we walked on down to Tarry Market to have a late lunch of focaccia and have a cola by Baladin whose beer I have enjoyed in the past. 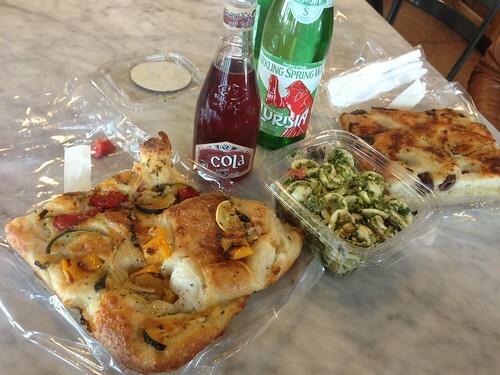 The guys also had their first taste of an extremely oil-heavy focaccia. The verdict: probably too chewy for a pair of guys with only four teeth between them. 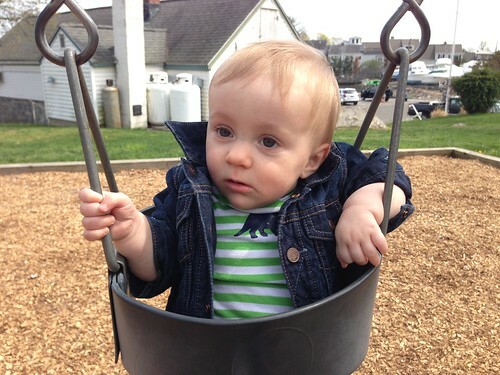 After lunch we headed to the park and Elliott got to swing for the first time. I was a little worried about how this would go but he loved it right off the bat. Martin fell asleep and missed the first round. 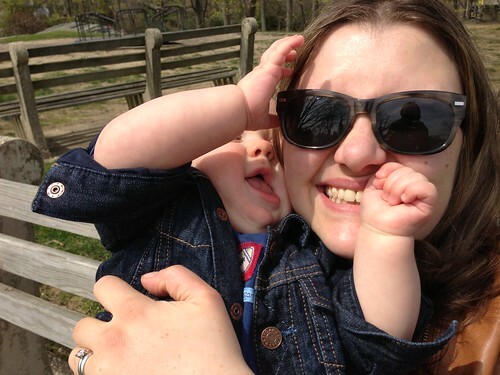 After Elliott had had enough swinging we attempted to take a nice picture of him with his mother. It went about as well as you would expect. 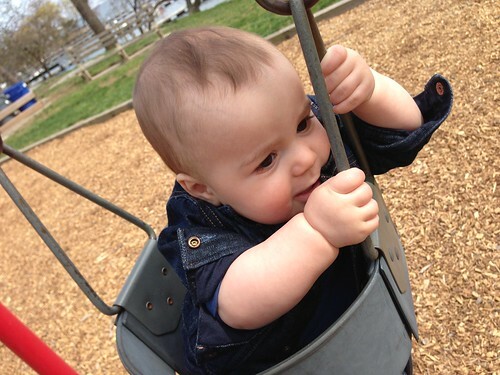 After Martin finally woke up he tried his hand at swinging. He's generally a little more cautious than his brother so I was expecting a little less unconditional acceptance. He took it rather well. Both of them were fearless on the swings, much to our delight. They also had some fun smacking the hell out of some bongos hey had at the playground. Before you drum circle nerds write in to correct me, I know, I know. Technically one of them is in the style of a conga and the other is more of a djembe. However, it's just more fun to say bongos. After our trip Martin's eye was starting to run and we knew that there was little chance he could survive Monday at daycare without being sent home. We decided to make a preemptive strike and we took him to the doctor to get tested. 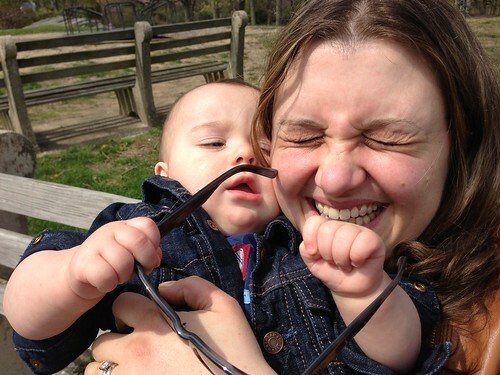 He had a clean bill of health, no pink eye, and we brandished the doctor's letter like a weapon we were prepared to unleash on day care the following morning. While Elliott was in the doctor's office I played with Elliott and noticed a wet feeling. On the down side he'd peed through his diaper, his onesie, his pants, my hoodie, and my t-shirt. 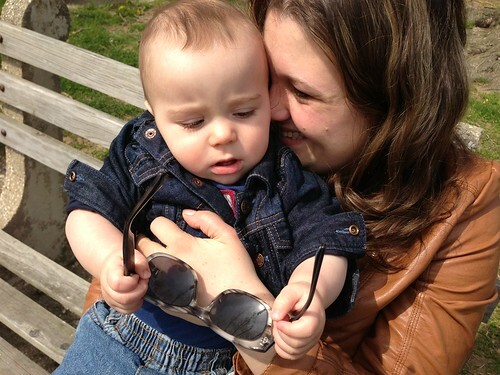 On the upside he got to look super cool in nothing but his jeans jacket like some sort of baby stripper. 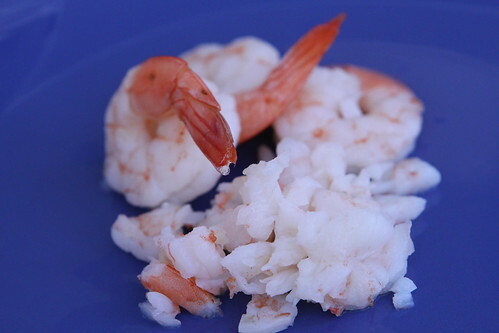 After feeding them their first dinner we gave them the last of the major allergens for them to try: shellfish. They seemed to like it fine but they weren't blown away. I guess that's good for when they get a little older and let them order off restaurant menus. 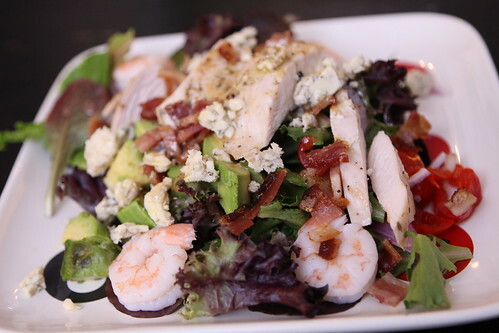 We even got to have a little of the shrimp ourselves on this salad I made with chicken, bacon, peppadews, avocado, red onion, and Fourme d'Ambert blue cheese. 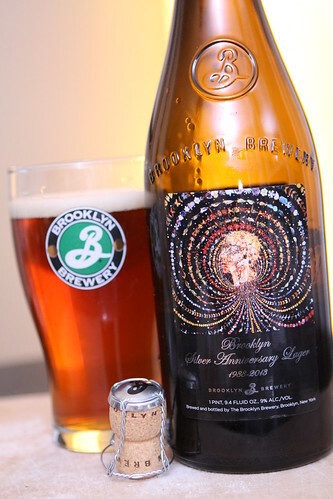 Jen was starting to feel pretty crappy around dinner time so I had this bottle of Silver Anniversary Lager from Brooklyn Brewery all by myself. This was an unusual beer. It came in at 9% ABV and just basically tasted like a much more flavorful and intense lager. 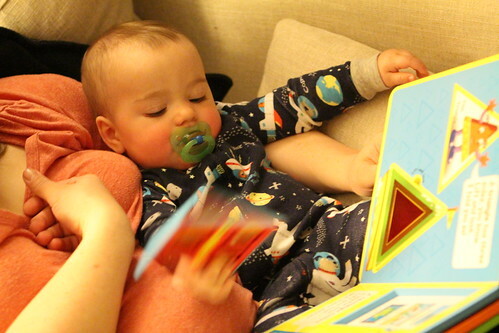 After a long day Elliott didn't really want to go to bed without a heavy dose of Tylenol. 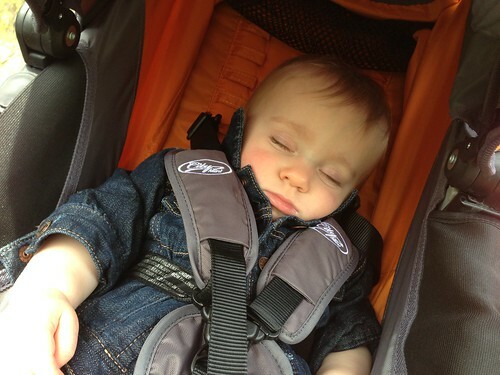 Even after the dose he stayed up with his mummy and looked at the magic glowing box until he slowly faded to sleep. Both mother and son were sick and soon sleeping. Next up in food for the boys, hot dogs and brats at Grandma's!